When i see posts like this, I smile!!!. It gives me soo much pleasure to see promos and contests. Its even more fun bringing it to you here. Below is a contest from MTN NIGERIA. This is your chance to showcase your talent in styling,designs and fashion generally. 1. 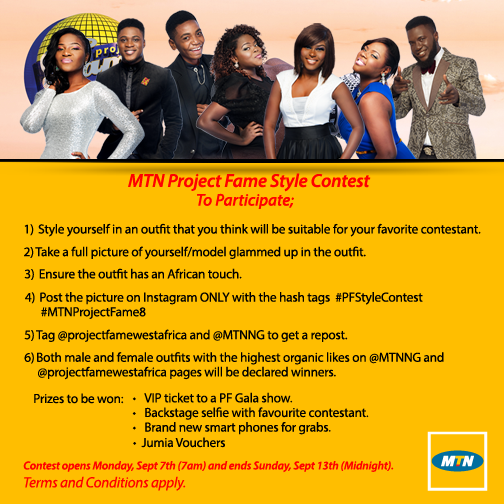 Style yourself in an outfit that you think will be suitable for your favourite contestant on MTN pROJECT fAME. 2. Take a full picture of yourself/model glammed up in the outfit. 3. Ensure the outfit has an African touch. 5. Tag @projectfamewestafrica and @MTNNG to get a repost. 6. Both male and female outfits with highest organic likes on @MTNNG and @projectfamewestafrica pages will be declared winners. Contest Opens Monday, September 7th at 7am and ends on Sunday 13th September at Midnight. Wear a yoruba outfit your pic will be accepted by pf. it's a pity they went from being west African to being Nigerian now they are yoruba before long they'll be just lagos yoruba.